Every local will tell you – to obtain the true feel of Cancun & Riviera Maya you must get out on the water. 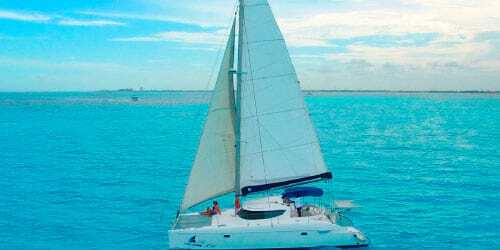 And there is no better way than taking one of our Catamaran Tours in Cancun, ideal to discover the top sightseeings this paradise has to offer sailing on a all-inclusive boat trip. Find at Happy Shuttle Cancun the best Cancun Boat Tours and let your dreams set sail! Rated as the best Catamaran Tour Cancun in the area, Isla Mujeres Catamaran Trip features an 8-hour boat ride full of fun activities for people of all ages, such as: Snorkeling in Isla Mujeres, Cat Fish encounter, Spinnaker Activity and much more. Every Private Catamaran Cancun will let you sail away through the crystalline waters of the Caribbean sea aboard fully equipped boats from 36 feet to 78 feet long, which combine luxury, safety and comfort. In the other hand for those looking to turn up the party with friends in amazing nature landscapes we recommend you to take one of our Booze Cruise in Cancun, where beats, drinks and good times are guaranteed all year long. Book now the cheapest Cancun Catamaran Tours in 2018 and let the sea set you free!